3 must-see attractions. 250 acres of unexpected. 1 awe-inspiring experience. At The Henry Ford, you'll discover America—its culture, inventions, people and can-do spirit—and hundreds of hands-on ways to explore it, enjoy it and be inspired by it. 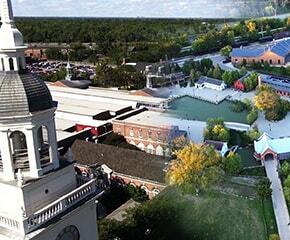 Prepare to be astounded by our attractions and resources: Henry Ford Museum of American Innovation, Greenfield Village, Ford Rouge Factory Tour and Benson Ford Research Center. A vibrant exploration of genius in all its forms, Henry Ford Museum of American Innovation allows you to experience the strides of America’s greatest minds while fully immersing yourself in their stories. And in doing so, discover your own path. Tap into your can-do spirit. Experience firsthand the sights, sounds and sensations of American perseverance: from working farms to Model T rides to the Wright brothers’ workshop, explore the place where America’s can-do spirit inspires you to go out and get it done. Experience the awe-inspiring scale of a real factory floor as you rev up your inner engineer. Get an inside look at the making of America’s most iconic truck, the Ford F-150, and immerse yourself in modern manufacturing’s most progressive concepts. Experience some of the most entertaining and enlightening stories of America’s past, present and future — in one of the nation’s most impressive venues for telling them. NEW state-of-the-art 4K digital projection, sound and seating.